MotoRoyale is offering a limited period price cut of Rs 80,000 on the SWM Superdual T.
Last October, MotoRoyale made big news by launching seven motorcycles on the same day including the launch of the brand new SWM Superdual T. Just a few months into the launch, the company has now announced a Rs 80,000 slash in the price of the Superdual T. This offer is valid just for the first 250 customers or up to 31st March. With this price cut, the Superdual T now demands Rs 6.50 lakh (ex-showroom) in comparison to the earlier Rs 7.30 lakh price tag. Interestingly, this price cut in the top-end T variant makes it cheaper than the Rs 6.8 lakh launch price of the standard trim. Powering the SWM Superdual is a 600cc single-cylinder liquid-cooled motor that develops 54bhp and 55Nm. This engine comes paired with a 6-speed transmission. As is typical of all dual sport offerings, this one too comes fitted with a 19-inch spoke wheel at the front and a 17-inch setup at the back. Braking duties are performed by a 300mm disc and a 240mm disc at the front and back respectively. 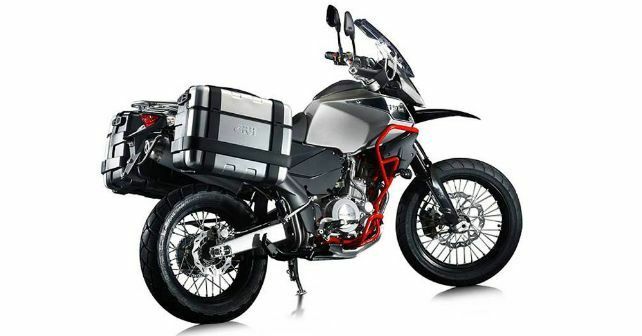 The Superdual T comes with factory fitted accessories like knuckle guards, fog lights, crash guards and more.